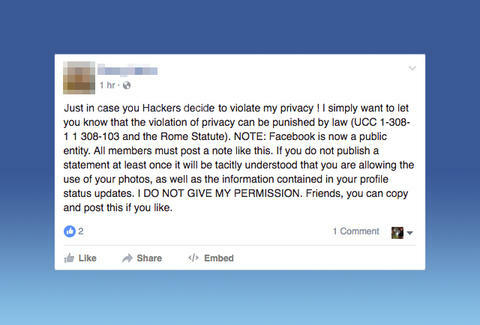 It seems that every couple years, Facebook users mount a collective rebellion against the social network, posting an annoying, misinformed status update about privacy. Yes, you consigned the company “non-exclusive, transferable, sub-licensable, royalty-free, worldwide license” to all the mundane selfies and trivial anecdotes you’ve ever shared on the website. The only way to nullify this clause is to delete your profile -- an easy enough endeavor, but how on Earth could you vent on social media without Facebook, your most mortal of enemies? Additionally, the status update cites laws UCC 1-308- 1 1 308-103 and the Rome Statute as the legal precedent for taking Mark Zuckerberg to court over this petty nonsense. The Guardian notes the Rome Statute's origin in the International Criminal Court, and that the law “deals specifically with genocide, crimes against humanity and war crimes. Copyright infringement and privacy concerns are a long way from their concerns." Anyway, before you post the righteous screed to your profile, give Facebook’s terms and conditions a thoughtful read. Yes, it’s a boring, jargon-filled set of rules, but it sure as hell proves one thing: The company has the upper-hand here, so delete your account, or get in line.